I have to admit the scale has not been my best friend. In fact I had been avoiding since my last pregnancy. Imagine my surprise when I pulled it out and it didn't work. So I had to look into a new scale. I had worked with Beets Blu previously and when they reached out asking me to review their new scale - I jumped on the opportunity. This was perhaps one of the easiest scales to set up. Just pop in the batteries and download the app. Everything synced up without any effort on my part. I like having the option to import the information to my other health app on my phone and I actually liked having the free Beets Blu scale app to work with it. You do need to step on this scale barefoot and it does give you BMI and Fat percentages. It is a great way to track your results when trying to lose or gain weight. Overall this was a hit. I like the sleek design and modern look as well. 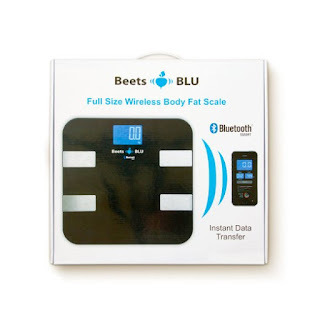 Visit Amazon to purchase your Beets Blu Wireless Scale.